RDM Equipment Sales and Rentals is the newest Terex Truck dealer. BRITISH COLUMBIA – Construction is big business in British Columbia right now, with lots of large scale projects taking place across the region. That’s why Terex Trucks has decided to strengthen its presence there by signing a new dealer – RDM Equipment Sales and Rentals. The majority of RDM Equipment’s customers are active in the mining, construction and landscaping segments. 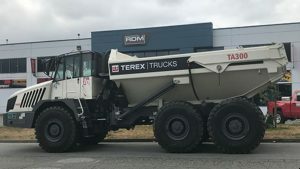 As a Terex Trucks dealer, the company sells, rents, services and provides parts for the TA300 and TA400 from its headquarters in Surrey, BC. RDM Equipment will be supplying Terex Trucks TA300 and TA400 articulated haulers within the province. The recently upgraded TA300 – which can haul 28 tonnes and has a heaped capacity of 17.5 m³ – now comes with the new ZF EP320 transmission. This means smoother gear shifting and a 5% improvement in fuel efficiency, as well as enhanced performance, productivity and operator comfort. As a result of this product upgrade, the TA300 also now comes with long life transmission fluid, increasing the length of time between oil maintenance intervals from 1,000 to 4,000 hours. In addition to all of this, the TA300 also has true independent front suspension as standard, further enhancing operator comfort and enabling excellent traction control and maximum productivity. The largest articulated hauler in the Terex’s line is the TA400. It is able to haul 38 tonnes, boasts a heaped capacity of 23.3 m³ and comes fitted with a Scania DC13 engine. It also has an Allison HD4560 transmission, high performance oil and offers up to 6,000 hours between service intervals. This heavyweight hauler also provides great traction and an effective power-to-weight ratio, which ensures material is moved quickly and efficiently at minimal cost. Visit www.RDMsales.ca to contact the newest Terex Truck dealer.